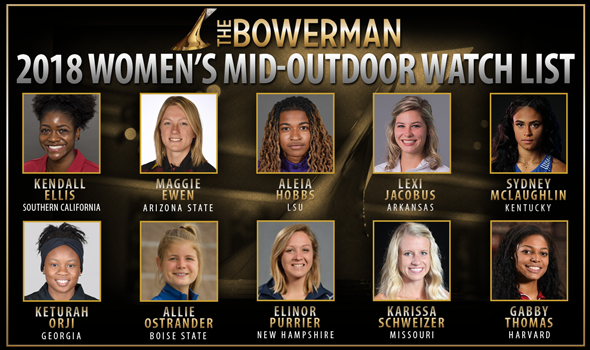 NEW ORLEANS – The 2018 Women’s Mid-Outdoor Watch List for The Bowerman, announced on Wednesday by the U.S. Track & Field and Cross Country Coaches Association (USTFCCCA), features nine women who graced the last Watch List released in March, as well as one new name. Boise State’s Allie Ostrander joined the mix for consideration for collegiate track & field’s highest honor with her performance over the last month. The redshirt sophomore becomes Boise State’s first Watch List honoree after simply dominating a solid field in the steeplechase at the Stanford Invitational. Ostrander ran a 9:38.57 to capture the event title in her lone competition of the 2018 outdoor track & field season to this point. The native of Kenai, Alaska, put her name in the outdoor collegiate record book with that time, as she became the eighth-best performer in collegiate history in the event. Her time was good for 14th in collegiate history, and it currently sits atop the NCAA Division I Descending Order List. Ostrander is amongst talented company, as she joins some of the best sprinters, distance runners, jumpers and throwers in the nation on this iteration of The Bowerman Watch List. Four returning women on the Women’s Mid-Outdoor Watch List in Arizona State’s Maggie Ewen, Kentucky’s Sydney McLaughlin, Missouri’s Karissa Schweizer and Harvard’s Gabby Thomas currently lead the NCAA in their respective events. Ewen, the lone thrower on the Watch List, has altered the collegiate record book in more ways than one during the outdoor campaign. The product out of St. Francis, Minnesota, broke her own collegiate record in the hammer throw with a mark of 74.53m (244-6) at the Sun Angel Classic, where three of her other throws in that same series rank amongst the top-six throws all-time. At the same meet, Ewen posted the second-best shot put mark in collegiate history with a throw of 19.22m (63-0¾). McLaughlin has also etched her name into history, as the freshman from Dunellen, New Jersey, ran a 50.07 in the 400 at the Florida Relays, making her the second-fastest performer in the event in collegiate history. She and three others also combined to run a 3:26.92 in the 4×400 relay, putting them in 10th place in collegiate history, as well. McLaughlin also sits second in the 200 (22.39) and seventh in the 100 (11.07) on the NCAA Division I Descending Order List. Schweizer has only competed once during the outdoor campaign, much like Ostrander. But also like Ostrander, Schweizer was dominant in her event. The Urbandale, Iowa, product ran a 32:00.55 in the 10,000 at the Stanford Invitational, finishing as the top collegian at the meet. Her performance puts her at ninth all-time in collegiate history. Thomas bested a field of 47 competitors that included 2011 The Bowerman winner Jessica Beard in the 200 at the Miami Hurricane Alumni Invitational. The Florence, Massachusetts, junior ran an NCAA Division I-leading 22.32 in the event in addition to running a wind-aided 11.04 in the 100 at the Home Depot Clyde Littlefield Texas Relays, good for the sixth-best 100 time in the nation on the season. Two other sprinters in LSU’s Aleia Hobbs and Southern California’s Kendall Ellis returned to the Watch List. The duo have seen success in nearly every meet in which they’ve competed so far this season. Hobbs notched a wind-aided 10.86 in the 100 at the Texas Relays, setting a wind-aided collegiate record in the process. The native of New Orleans sits atop the NCAA Division I Descending Order List in the event while also having anchored the Tigers’ NCAA Division I-leading 4×100 relay team that posted a time of 42.50 at the LSU Battle on the Bayou earlier this month. Ellis has won event titles in the 200 at the USC Power 5 Challenge and the USC Trojan Invitational this season, but her top-time in the event came at the Sun Angel Classic, where she ran a 22.91 into a headwind. The senior from Pembroke Pines, Florida, currently sits 12th on the Descending Order List in the event. Ellis also ran the second leg of the Trojan’s 4×100 team that ran a 43.11 at the Sun Angel Classic, making Southern California the second-best program in the event on the season. A pair of jumpers from the SEC also found their names on the Watch List once again in Arkansas’ Lexi Jacobus and Georgia’s Keturah Orji. Both Jacobus and Orji sit second on the Descending Order List in their respective events. Jacobus notched a 4.55m (14-11) in the pole vault at the Texas Relays, while Orji recorded a 6.71m (22-0¼) in the long jump at the Spec Towns Invitational. New Hampshire’s Elinor Purrier rounded out the Watch List, but the senior from Montgomery, Vermont, has yet to make her season-debut on the outdoor circuit after a strong indoor campaign. Falling off the Watch List, but receiving votes was Georgia’s Lynna Irby. Also receiving votes was Arkansas’ Taliyah Brooks, Texas A&M’s Jazmine Fray and San Diego State’s Ashley Henderson. The next Watch List will be announced on May 2.